Believe it or not, it's been almost 20 years since the isometric third-person shooter Postal inflicted itself upon the world. It wasn't particularly good, by most accounts, but earned considerable notoriety for its wanton, over-the-top, and entirely gratuitous violence. It inevitably spawned a couple of sequels (that were even worse) and a Uwe Boll film. 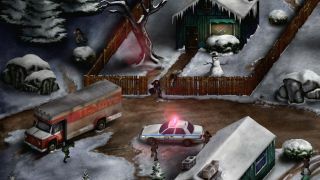 In 2014 developer Running With Scissors announced that it had begun work on an HD remake entitled Postal Redux. Today the studio announced that Postal Redux, which it describes as a “psychological thriller with a grim art style and frightening ambiance,” will be out this spring. It will add new content to the original, including a Carnival level, and a new score-based Rampage Mode, “which encourages an aggressive style of play by increasing a multiplier for each consecutive kill in a streak.” At the end of each level, players will be graded based on the level of mayhem they unleash upon the world. The minimum system requirements have also been posted on Steam. They're subject to change, but for now are pleasingly low. The original Postal remains available on GOG, if you dare to compare. Does Postal Redux look two decades better to you?